The RPC Volunteers Program is a new initiative whereby local volunteers based in Malawi gain valuable experience and knowledge while creating a real impact through a range of activities in rural communities. The major immediate beneficiaries will probably be the volunteers themselves. Andrew Chimalizeni with Pat Boland in Ntchisi. Commonly, volunteer programs in Malawi are international in nature. 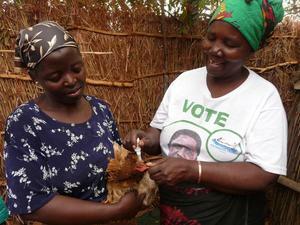 They rely on international volunteers who spend time in Malawi and then move elsewhere. 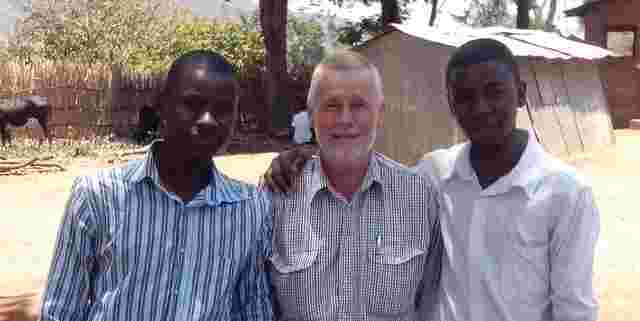 By contrast, the RPC Volunteers Program uses volunteers who live here in Malawi. Whilst any eligible person might be involved as a volunteer, it is expected that participants will more likely be university/college graduates who have not yet settled into long-term or heavily committed occupations. Indeed, RPC will actively solicit prospective candidates from tertiary institutions such as LUANAR (Lilongwe University of Agriculture and Natural Resources) at its Bunda and NRC campuses. Each participant will be assigned to a documented program of activities which have been chosen and refined beforehand with an overall objective of improving small scale and village poultry production. RPC will keep an up to date list of potential programs and publicise these as appropriate. Identification of volunteers and work programs will be consistent with the ACFID Practice Note: "Responsible International Volunteering for Development". Participants will be required (as do all RPC personnel) to conform with RPC's own Code of Conduct which is based on internationally recognised principles. Funding will be sought from individual donors or small groups, with a typical program expected to cost $500-1,000 overall and be of a duration of about 2-6 months. In many cases, the work will be part-time or intermittent in nature. The number of volunteers supported by RPC will depend on the extent of donor support. Volunteers will be asked to prepare reports and information about their activities specifically aimed at the respective donors. Typically, volunteers in the program will be young men and women who, perhaps more than many of their peers, are willing to chart unknown territory. The practical experience of working with RPC will assist these future leaders to understand rural communities and the challenges in achieving improvements in livelihoods. That experience will undoubtedly be beneficial for their future careers. A key element of the program will be preparatory training of the volunteer. This will include technical training appropriate for their program, training and guidance in the RPC code of conduct and related operating policies, and familiarisation with the principles of international development in the context of RPC's work. This learning process and experience will also undoubtedly be beneficial for the future careers of participants. Much of the expected activities will be in the nature of practical field based research and investigation. 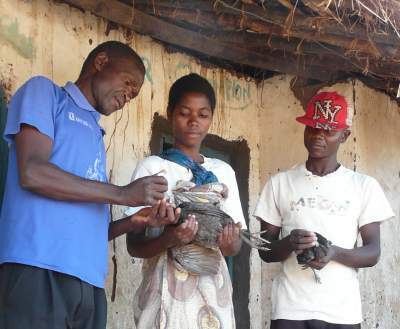 There are numerous unknowns about the situation of rural poultry and the program will provide an ideal mechanism to collect information which is important in broader decision making. The use of local volunteers will have the advantage that cultural differences in rural areas will be minimal hence avoiding a lag phase which may exist with outside volunteers as they "find their feet". Moreover, use of local volunteers will have a more constructive development impact and reduce the likelihood of exclusion of local expertise or marginalisation of local individuals, groups or communities. Prospective donors will have the opportunity to support a work program they consider significant. They will have a say in the program of activities and may well contribute suggestions to improve the impact and outcomes of the volunteer's activities. Through the reporting arrangements for the volunteer, donors will get a clear indication of the results of their generosity. RPC secures a pledge of financial support from a donor, who may be an individual or a small group, and who may wish to specify the area they want to be covered. Arrangements for the support are clarified before RPC begins the program. RPC identifies and contacts a suitable volunteer from its list of potential candidates. The broad logistics (timing, location, program requirements, support, costings, security, etc) are discussed and agreed. As far as possible, the obligations and responsibilities of the volunteer are clearly outlined in writing so as to avoid misunderstandings. Arrangements for preparatory 1-2 day training are made. Training includes technical aspects as well as the RPC's Code of Conduct, values, modus operandi and overall operations. The volunteer is placed at their work location and begin duties as per the program description. RPC monitors progress, in particular within the first fortnight or so, to ensure smooth operation. Regular communication between the volunteer and RPC headquarters is encouraged. The volunteer reports on at least a monthly basis on their work, in accordance with a pre-arranged format. Reports to the donor(s) are prepared and sent. The volunteer is encouraged to communicate directly with the donor(s), probably via email, as appropriate. Towards the finish of the program, the volunteer prepares a final report again following a skeleton format. The report includes a description of the work, the impact, successes and failures, and recommendations for extension or further inputs. This report is also communicated to the donor(s). In conducting its Volunteers Program, RPC will prioritise both the tasks which will be undertaken and the applicants who might be best suited as volunteers for that task. the cost and logistical requirements. preference will be given to younger volunteers. Formal interviews will not normally be held to evaluate applicants. However in cases where deemed necessary, interviews may be held in order to confidently assess the suitability of applicants under consideration. It should be noted that an over-riding consideration in the selection of both tasks and applicants will be a requirement for a good match between the aptitude of the applicant and his/her suitability to the particular task under consideration. Tasks for which no suitable applicant is available, and vice versa, will be placed on hold. An even higher over-riding consideration in going ahead with a particular task will be the availability of funding. RPC management will embark only on tasks for which funds have been pledged or allocated. What Volunteer Programs will there be? We've considered a wide range of possible activities: marketing, field studies, use of technology, socio-economics, and more. See here for details. I'm interested as a possible donor.